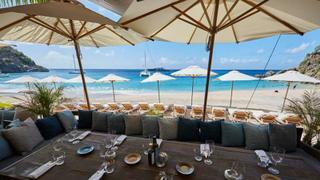 Other hotels reopening this season include the Cheval Blanc St Barth Isle de France. 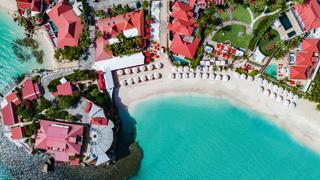 St Barths natural beauty has remained largely unharmed. Picture courtesy of Jeff Brown. On an island like St Barths, the lulling soundtrack of paradise usually prevails – a breeze in the palms, waves lapping the shore and tropical birds cooing in the trees. But this past year, a new sound has joined the island symphony. Accompanying the trill of the Lesser Antillean bullfinches is the bang of a hammer, the grind of a digger, the whir of a drill. On a typical getaway, these noises would not be welcome. But after the punishment St Barths has endured, this is the uplifting sound of progress – and music to everyone’s ears. The French Caribbean island was hit by back-to-back hurricanes in 2017, with Irma, José and Maria hurtling through. Irma proved the most devastating to St Barths, whipping the 25 square kilometre isle with gusts of up to 320km/h. Houses were flattened, beachfront hotels washed away, and boats strewn around the usually protected Gustavia Harbour, where high-end shops from Dolce & Gabbana to Louis Vuitton line the quay. The island may be renowned for its designer boutiques, gourmet dining and plentiful people-watching, but sailing is also in St Barths’ blood. 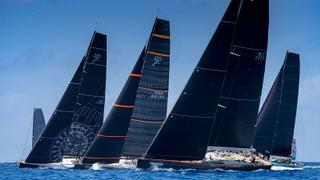 Combining its stylish and sporty natures, the superyacht regattas take over each spring – the St Barths Bucket Regatta in mid-March and Les Voiles de St Barth in mid-April. And, after the catastrophic storm season of 2017, it is the yachting community that has helped bring this island back to life in record time. Along with the fabled yacht-hopping New Year’s Eve celebrations, the regattas make an enormous economic impact on the island. In the hours and days after the storm, long before anyone reached a starting line, donations were pouring in from regatta stewards and owners. Even in the hurricanes’ chaotic aftermath, regatta organisers made a commitment that the races would return to the island, sponsors lined up to finance the events and yacht owners began signing up to attend. “We heard from a lot of owners early on that they would be back no matter what,” says Peter Craig, St Barths Bucket Regatta event director and race chairman. Altruistic attendees included newcomers, such as Mark Shores, who decided right after Irma to send his yacht Marae to the Caribbean for the winter and participate in the Bucket for the first time to support St Barths. “Whenever catastrophic events like this happen, negativity can take hold,” says Craig. He notes it was important to the regatta stewards that the race press on regardless – even if only six yachts turned up. Instead, 26 tacked and gybed around the island last March. It was lower than the average fleet of 35, but still impressive considering how many yachts abandoned the Caribbean last season altogether. 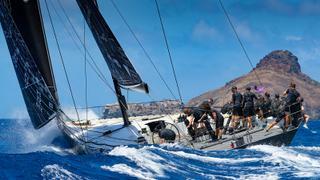 A month later, Les Voiles hosted a 53-strong fleet in seven classes, and all of its sponsors returned. “There was no question about coming back,” says Peter Harrison, CEO of watchmaker Richard Mille, the event’s title sponsor. Harrison is an avid racer and had his Maxi 72 Sorcha competing. Another Les Voiles sponsor echoed this sentiment of commitment. “We have a 30-year history with the island and its people, and one storm doesn’t change that; instead it strengthens our commitment to St Barths,” says Stiles Bennet, president of WIMCO Villas. During the rebuild, Eden Rock put on a pop-up restaurant at its villa rental property a few beaches to the east. The hotel began taking reservations again in June and is due to reopen three days before Christmas after an extensive rebuild. The redesign is aimed at retaining the hotel’s heritage and relaxed beach style, while bringing in new features, such as a casual beach bar and two suites with private pools. 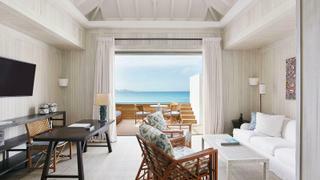 Five more of the island’s favourite properties – the Cheval Blanc St Barth Isle de France, Le Barthelemy Hotel & Spa, Hotel Le Toiny, Hotel Christopher St Barth and Le Sereno Hotel – are also set to reopen this December. Nearly every restaurant has reopened already, except those connected to a hotel, and most of Gustavia’s 150 shops opened a few months after Irma hit. Whether sipping a strong margarita or a glass of perfectly chilled rosé, even the saltiest of sailors appreciates a good beach bar, and those are also back up and running. Returning visitors this winter can go to Shell Beach, which is home to the Greek restaurant of Shellona, to dine under sail-shaped canvases hung in the palm trees, shading tables set in the sand. Or head to white-tented Nikki Beach on the other side of the island at Plage de St Jean (dancing on the tables after a seafood feast is de rigueur). 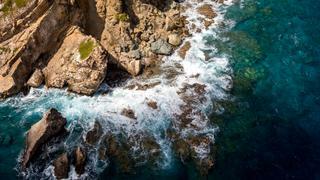 While its most glamorous hotspots took a battering, St Barths’ natural assets have remained largely unharmed and offer a different aspect of island life. Experienced surfers flock to the wild, southern coast of the island, catching a wave at Toiny Beach, while St Jean and Lorient beaches on the north coast are better suited to beginners. There is also excellent diving and snorkelling thanks to the Sea Turtle Recovery Action Plan for the Netherlands Antilles, which was signed in the early 1990s. St Barths’ Marine Reserve was created shortly after in 1996 and over the past two decades turtles have started to reappear on the island. A great place to don mask and flippers and spot them is the harbour off Grand Colombier beach. This remote cove is only accessible by foot or boat, with stunning views on the hike down, dodging cacti along the way. If taking the easier option and arriving by tender, the cove is also the ideal spot for sipping a sundowner of your choice in complete solitude. There are more lofty lookout points and remote beaches that are without a club or any man-made commotion that you might imagine on the island. Sailing around its shores, taking in the views of the turquoise sea meeting wide sandy bays and rocky islets, it is easy to see why people gravitated to St Barths a long time before the luxurious establishments came to typify it. If there’s one thing that last year’s storm season proved, it’s that this little island is well loved and resilient. St Barths can take a hit and get back up again, handling any rogue waves that come her way. First published in the October 2018 edition of Boat International.